As the 19th century drew to a close, the word “Panama” was synonymous with failure. The French, amid scandals and financial ruin for throngs of public investors, had ceased operations to build a canal linking the Atlantic and Pacific oceans. Thousands of workers had already died on “the Isthmus”, great fortunes had been made and lost, and the entire nation of France looked upon the whole affair as a stain of dishonor on the entire French people. Yet the promise of a canal beckoned. With Theodore Roosevelt now in the White House, the United States began its own effort, picking up where the French left off. 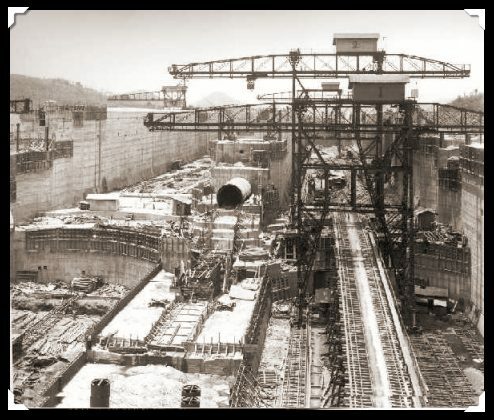 In David McCullough’s Path Between the Seas: The Creation of the Panama Canal 1870-1914, the story of how one of the greatest engineering feats in the history of man is told. From the White House to the jungles of Central America, here is this month’s read. In the late 19th century, the desire for a means of traversing the Atlantic and Pacific oceans via an aquatic “bridge” was not a new idea. From the earliest New World expeditions, the benefits of not having to circumnavigate what would become known as Cape Horn were well understood. However, it was the California gold rush of 1848 that put the issue in immediate economic terms. One of the greatest “enabling technologies” of modern history was the Panama Railroad, built to serve traffic across what was then a remote territory of Colombia. In fact, before the railroad was built, numerous stagecoach companies sprang up to carry people and cargo back and forth from ships sailing to and from San Francisco and those serving the eastern United States and Europe.The first serious effort to understand what it would take to build a water canal to replace the railroad was undertaken by the French, specifically, Ferdinand de Lesseps. De Lesseps was part of the team that built the Suez Canal, and a hero of France for the engineering and commercial success of that project. According to David McCullough in his magnificent Path Between the Seas: The Creation of the Panama Canal 1870-1914, it was the perception of de Lesseps and many of his colleagues that they already had a firm grasp of the scope of the Panama project, even before making a survey of the land itself. The reasons for this vary from intellectual pride to greed, but nonetheless the French team was able to raise enormous funds from numerous public offerings for the project. After years of toil and financial intrigue, de Lesseps and the company he built for the undertaking eventually went bankrupt, leaving the way clear for other superpowers to consider involvement. McCullough makes very plain that the individual will and vision of newly elected president Teddy Roosevelt, more than any other American, drove the United States to pick up the existing infrastructure, machinery, railroad, and vast quantities of material already on the ground in Panama for a bargain. Years later, it is clear that he even indirectly pushed for the revolution that removed Panama from Colombian rule and brought the new country within America’s influence. The story of how the canal project was actually executed is a very complex one. More than 20,000 men died during the four decades of surveying, excavation and construction. Fortunes were made and lost. McCullough does his usual magic of telling this extraordinary story in terms that are not only thorough, but exciting and interesting to read.